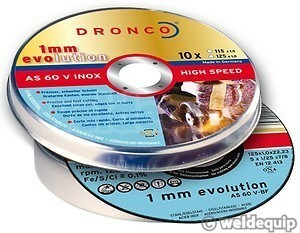 The DRONCO AS 60 V Inox Evolution cutting disc is the landmark of ultra-thin 1.0mm discs. 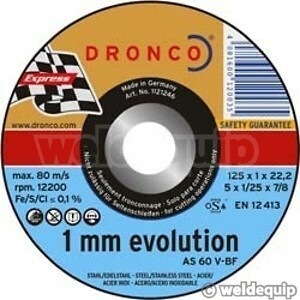 The very best available, they are suitable for cutting a wide range of materials including Stainless Steel & Mild Steel with minimum effort. Extremely fast cutting with minimal burring or thermal bluing, together with an ultra-long service life, make them the 1.0mm disc of choice. 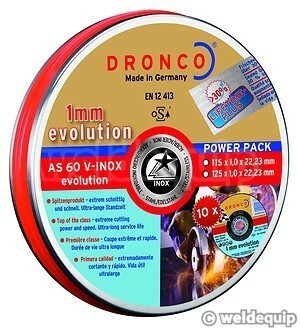 Supplied in a steel storage tin containing 10 discs. “Lifetime-Plus” sealing at the factory in Germany ensures they last at least 30% longer than other discs whilst in storage.